Fairly common in open habitats at low elevation in western counties and at moderate elevation in agricultural areas of Kittitas Valley. 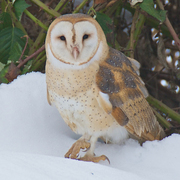 Relatively low detection rate largely attributable to owl's highly nocturnal habits and spotty nocturnal BBA surveying, compounded by observer access problems to nesting barns. Present within urban districts where adequate open habitats exist, although underrepresented there by BBA records. Predicted range mapped throughout eastern Kittitas County steppe by Washington Gap report (Smith et al. 1997) not supported by BBA records. 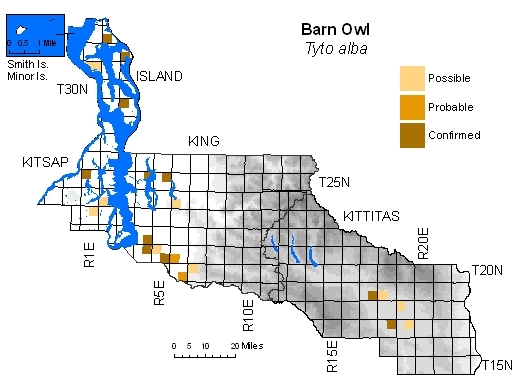 Stepniewski (1999) notes that Barn Owls only appeared in nearby Yakima County with conversion of shrub-steppe to irrigated agriculture.